45-minute interview with Ben and Aaron from Mysterious Universe. We talked about Skeptiko, Why Science is Wrong, and this silliness of Materialism. Really fun to do. 45-minute interview with Ben and Aaron from Mysterious Universe. This was another excellent interview of Alex (and his book) by two funny and intelligent interviewers that I had never heard before. I immediately bookmarked their show "Mysterious Universe" and look forward to exploring more their website. Thanks! I liked the analogy of Skeptical ideology (Blackmore, Radford, Watt, etc.) to Fox News. Also, nice to hear (non-religious) British voices open to critiquing materialism, Skepticism, ideological atheism. That would be Australian interviewers, Ian. 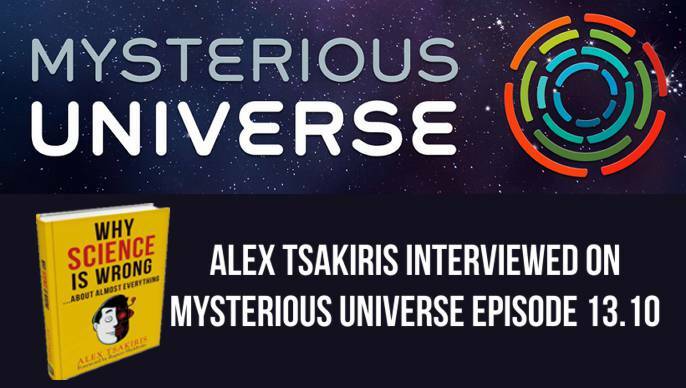 Two of my favorite podcasts are Skeptiko and my "Aussie Boys" at Mysterious Universe…so imagine my delight having Alex as a guest with Aaron and Ben. Muy Bueno!! I will be posting down at the thread next. Thanks again to Adam and Ben for the brilliant introduction. I am going to re-listen to it again before posting...... for those that might read this before I get to commenting on the Dr. David Lane episode. Welcome IGWT... look forward to your postings. Wow, that's a great archive. You just click on the link and the interview starts playing. Fantastic. (I'm sure you know this Ian, but I do get this question) if you want to download any of them just right-click and save as. Enjoyable podcast where Alex opens up on the background of his beliefs and his discontent with the scientific solution into the nature of consciousness, which started a journey in pursing the truth from leading academics and led to the title of his book, Science is wrong about everything. The show discusses Alex's ventures in pursing truth about the nature of consciousness from some leading accadmics in the field of neurology, who through Alex's search for truth was met with a void after asking for answers and posing fundamental questions to the experts, not only does Alex discover that the experts have insufficient answers, he discovers that they make false claims about the conclusion of another scientists results, namely Van Lommell, And how another expert offers rebuttals to NDE's and how a materialistic explanation can be given, despite previously admitting not having any sufficient knowledge of the NDE phenomena. I found it funny when these scientist were considered to be the Fox News of science, in other words its mostly propaganda what they are feeding us. I was intrigued but not surprised that Alex admitted that the crunch came when a Bhuddist scientist inspired Alex with the deeper questions and answers sought about consciousness, I personally haven't watched all the shows but I would appreciate some well known eastern spiritual masters to come on the show and see if they have a good argument to answer Alex's questions. Overall this was a great show and the second different podcast station other than scepticality I've listen to with Alex, I think I will listen to the Mysterious Universe podcast again and check out the show. But there's still lots more to do on Skeptiko.